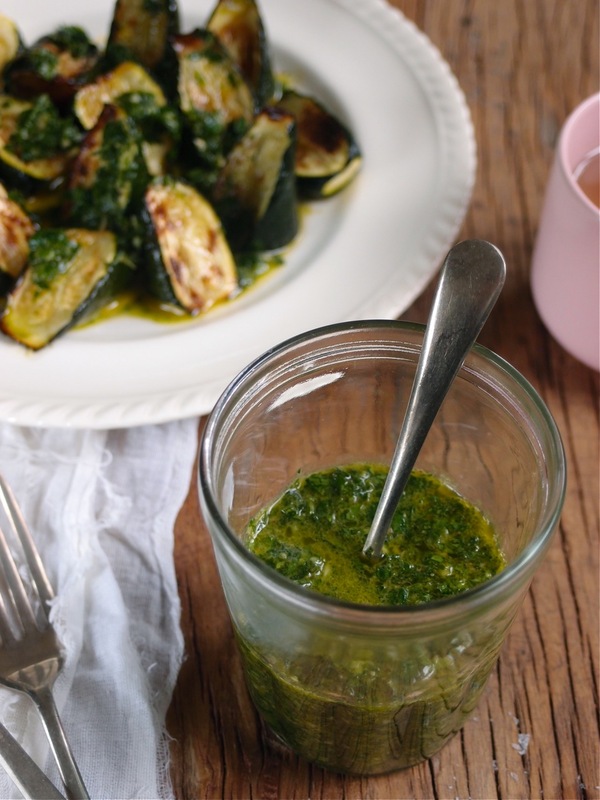 Chermoula is extremely versatile; it may be used as a marinade or sauce. You can pimp up any vegetable, fish or meat. 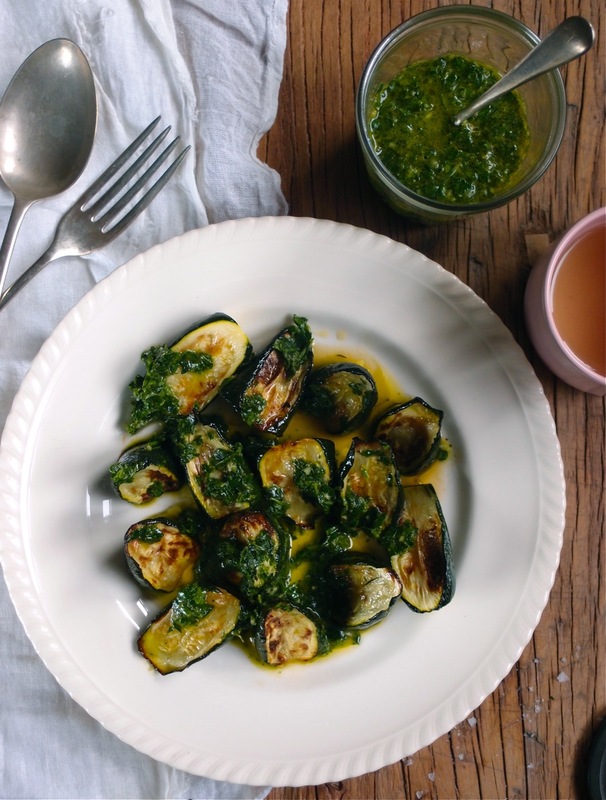 I have used it here over roast zucchini. Other herbs, spices or ingredients can be added or substituted, such as oregano, mint, ginger, chili, onion, turmeric or paprika. Soak saffron threads in 1Tb hot water. Blitz ingredients until combined (or mingle in a mortar and pestle) leave consistency a bit chunky, combine saffron. Use as a sauce or marinade. Chermoula keeps covered in refrigerator for up to 4 days. This is a delicious starter or side dish. Simmer beetroot for 30min, cool, peel and slice finely with mandolin. Heat 1Tb olive oil and sauté onion with a pinch of salt on a low heat for 15min. Add orange juice, zest, carrots and 1Tb cider vinegar. Simmer for 15min. Strain carrots and onion, retaining orange liquid. Return orange juice to heat to further reduce. Meanwhile arrange beetroot and carrot on a plate, season with salt and pepper. Remove orange jus from heat, stir in 1Tb apple cider vinegar and 1Tb olive oil, taste for seasoning. 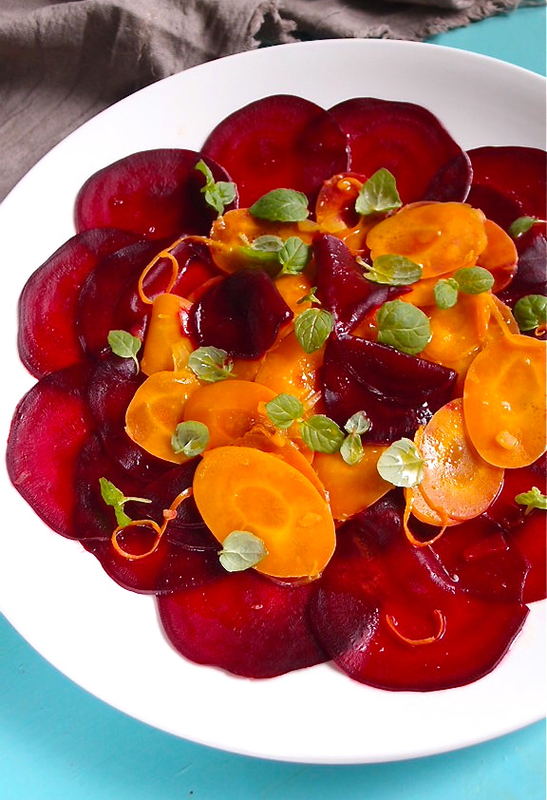 Drizzle dressing over beetroot and carrot, top with micro herbs. Blitz together milk, bananas, and cinnamon. Add chia and combine. Pour into glasses/bowls and refrigerate for several hours or overnight. Toast almonds in a dry pan, set aside. Heat coconut oil in pan and fry figs until golden. 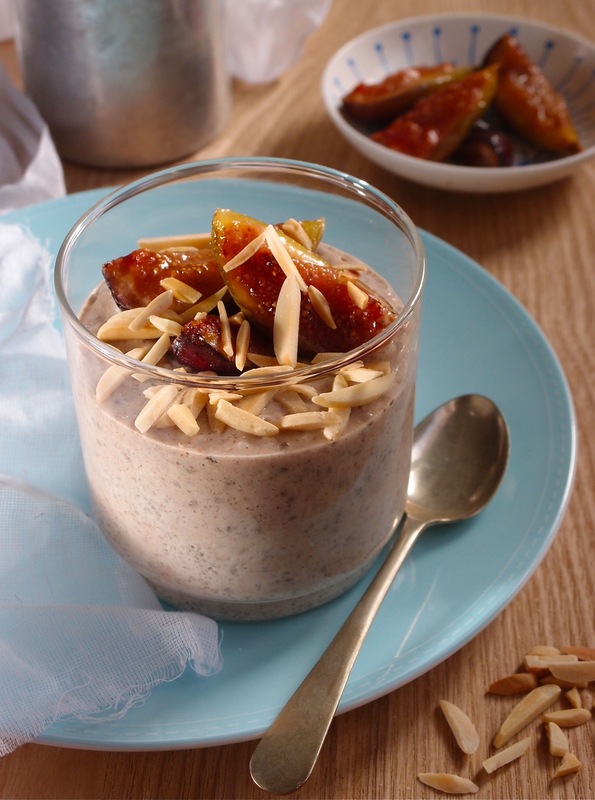 Top puddings with fig and almonds. Chia seeds are a great source of fibre having 40% fibre by weight. They are also high in protein, iron and omega 3 fatty acids. In a large pot heat 2Tb oil add onion, celery, carrot (not Dutch)and garlic; sweat for a few minutes until softened. Add tarragon, peppercorns, parsley stems, salt and water. Simmer for 40 minutes, liquid will reduce by half. For the crumb, Blitz together all ingredients. Heat 1Tb oil in fry pan and fry tofu on all sides. Press crumb together firmly and place on top of tofu. Bake in oven for 15mins or until crumb is golden. Strain broth into a bowl, discard solids. Return liquid to pot over a medium heat and season to taste. Simmer Dutch carrots in broth for 5mins. Add asparagus and peas cooking for a further 5mins. To serve, gently place crumbed tofu in bowl, pour broth and vegetables around. Tarragon has the flavor of sweet aniseed and mild vanilla. This recipe is also great with the fish replacing the tofu. Sprinkle pumpkin with paprika and salt. Drizzle with olive oil and toss to coat. Bake in 180° oven for ½ hour, turn half way and add garlic after 15mins. Toast almonds in a dry fry pan for 3mins or until golden. Remove and set aside. Heat 1Tb olive oil in fry pan and add sage, fry until crisp approx. 20 seconds. Set aside on paper towel. To assemble arrange pumpkin, rocket, peeled garlic and ricotta on a plate. Top with sage, almonds and a drizzle of olive oil. Fresh sage leaves can be covered in olive oil and refrigerated for up to 3 weeks and oil will be flavored for use. Bring almond milk and salt to boil in a saucepan. Stir in lemon juice, milk will curdle, turn heat off and sit for 10 minutes. Pour mixture into muslin lined sieve. If you do not want ricotta to have a lemon tang (which I like) rinse curds with cold water. Drain in sieve for 1 hour then gather cloth corners and gently squeeze out excess liquid (whey). Place in a pot, cover and refrigerate. Ricotta can be served with lemon zest, herbs, a drizzle of olive oil; use as you would any ricotta for bread, salads, baked etc. Store in refrigerator covered for up to 4 days. Ricotta is easily made using any milk. When an acid (lemon or vinegar) is added to milk it will curdle separating the Curds and Whey. Whey can be used for smoothies or baking. Place all soup ingredients in a food processor. Blitz until smooth. Taste for seasoning and adjust if required. Pour into a jug and refrigerate for at least 1 hour to chill. Blitz crumb ingredients in food processor until combined. Spread on a tray and bake at 180° for 10min or until golden. To serve, pour soup into cups, glasses or bowls and top with crumb mix. Blend basil, water and lemon juice together. Pour into a container, cover and freeze for ½ hour, then rake with a fork. Freeze for a further hour, break up and blend again until smooth. Cover and return to freezer until ready for use. Place parsnip slices in single layer on a baking paper lined tray, drizzle with olive oil and season with salt & cayenne pepper. Bake in preheated 180° oven until edges turn golden, approx 15min each side. To serve place parsnip chips on tray, top with tomato, drizzle of olive oil and salt. Use a melon baller to scoop sorbet and place on top. Garnish with fresh basil leaves. Preheat oven to 180°. Place grapes on baking paper lined tray, drizzle with olive oil, some thyme sprigs and season with salt and pepper. Roast for 30min or until skins are slightly crispy, center will be soft. In a saucepan sauté onion in 1Tb of oil on a medium heat, until softened not brown. Add 2tsp salt, milk and cauliflower, simmer covered until soft, approx. 20min. Stir occasionally. Blitz with stick blender until smooth. For the jus. Simmer apple cider vinegar, water, garlic (whole), 1Tb salt, 8 sprigs thyme and paprika until reduced to 1/4 C. Discard garlic cloves and thyme. The sweetness of the grapes will balance out the jus acidity. To serve, top cauliflower with grapes, jus, pepper and fresh thyme. Apple cider vinegar (ACV) is crushed apples, which have been fermented in barrels. It is a natural cleanser due to its high probiotic content and natural acidity, which alkalizes the body. A tablespoon is recommended daily in water for full alkalizing benefits, raw unfiltered is best. Grill watermelon slices for 2 min on each side, grilling makes it sweeter and slightly smoky. Boil edamame for 5 min and drain, remove from pods if necessary. For dressing mix together ginger, salt, pepper, sesame oil, olive oil and lime. Taste and season for balance. To serve, top grilled watermelon with edamame, watercress, mint and dressing. Edamame are young green soybeans. They have a sweet light nutty flavour, delicious hot or cold and are highly nutritious.